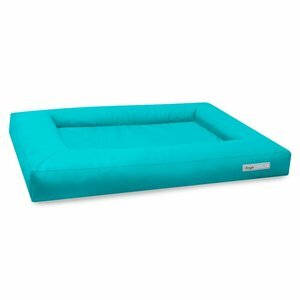 A fine turquoise contemporary art leather dog bed with reinforced bottom, that is not only durable, but also very simple to clean. A fine turquoise art leather dog bed that is well suited for dogs that like to lie against an edge. All the sides and the bottom are attached to each other with zippers, whereby each part can be washed separately and can be reordered. Due to this construction of this particular dog bed, the maintenance is simplified and the life time extended.